23rd Annual International WebAward Competition for Web site development at www.webaward.org. The WebAwards is the standards-defining program that sets benchmarks for 96 industries, including technology, computer hardware, computer software, electronics, info services, applications services providers, interactive services and internet service provider websites, based on the seven criteria of a successful web site. The deadline for technology web sites to enter to be judged is May 31, 2019. Boston, MA, March 14, 2019 --(PR.com)-- The Web Marketing Association is looking for the best technology websites in the world as part of their 23rd annual international WebAward Competition for Web site development at www.webaward.org. 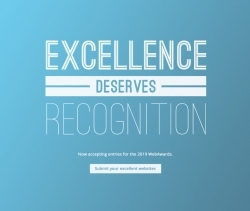 The WebAwards is the standards-defining competition that sets benchmarks for 96 industries, including technology, computer hardware, computer software, electronics, information services, applications services providers, interactive services and internet service provider websites, based on the seven criteria of a successful web site. The deadline for technology web sites to enter to be judged is May 31, 2019. Websites are judged on seven criteria including design, innovation, content, technology, interactivity, copy writing and ease of use. Each WebAward entry in the technology category is judged against other technology websites and then against an overall standard of excellence. All technology entrants benefit from receiving valuable feedback in terms of their specific criteria scores compared against the average scores for their industry. They also may receive specific comments from the WebAward’s professional judging panel on their Web site development efforts. Each year, the Web Marketing Association names the Best of Industry for the various technology categories based on the score they receive from the WebAward judges. 2005 - Intelithought, Inc. for Intelithought, Inc.
Technology Websites can be entered into consideration for the 2019 Best Technology Website WebAward at the WebAward Website.